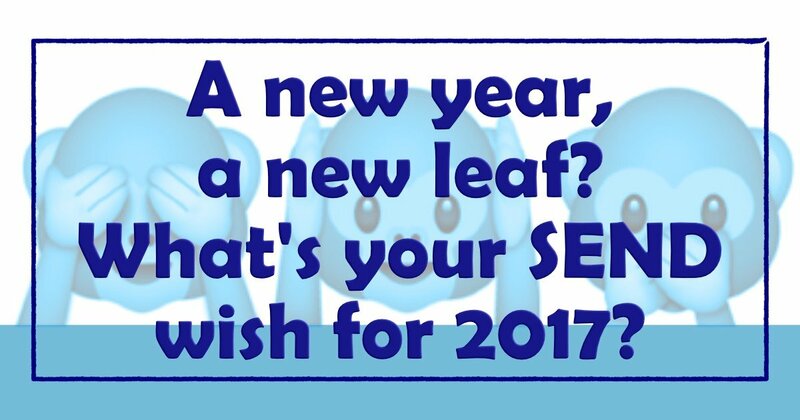 Home Autism A new year, a new leaf? What’s your SEND wish for 2017? And so, we leave behind the detritus of 2016 with its never-ending celebrity deaths, seismic political upheaval and general air of doom. It was a pretty rubbish year for parents of children with SEND too. I was so depressed by the end of it, I have contemplated chucking in the SNJ towel and never writing another post on here. My sons' EHCPs expire in July, after all. When I look online it seems so many parents have a keen grasp on the law and yet so many are coming up time and time again against intransigent LAs unwilling to pay heed to it. Far too many parents still end up heading to the First Tier Tribunal after no assessment, no EHCP, no placement or a plan that is so shockingly badly written, it's possible it was about another child entirely. This wasn't supposed to happen, was it, Mr Timpson? You were warned that there wasn't the training or the will to take a prescription-lite SEND Code of Practice and have LAs and schools see the light (think Saul on the road to Damascus), and create innovative systems and structures, ensuring parents are at the heart of decision making and children's outcomes were on the way to being met. The DfE was warned it was about to go pear-shaped and warned again. Each report that came out, from Bren's, to Amy Skipp's to Lee Scott's confirmed what we all knew. We even presented them with mounds of parental evidence. But the DfE did the see/hear/speak no evil thing. Over and over again. These reports might have more impact if we rolled them all up into a cosh and bashed Mr T over the head with them. So as the smoke from 2017's fireworks fades into the night, what do we parents hope the new year brings with it? For our family, 2017 will be a momentous year, as my boys move on to higher education or perhaps a gap year for one of them, and I am left in an empty nest. After an extra year in FE, my older son is going through auditions for drama schools/uni degrees, while my younger son already has two offers for Media/Film degrees under his belt so far. Their abilities are not in doubt. How they will cope with their ASD personalities and thinking is already keeping me up at nights. Should we move closer to where they'll be? Half-way between them? Should we just get a grip? It's such a huge step - for all of us. I will have to speak to university Learning Support departments about adult sons, passing on now-no-longer-legal EHCPs and hope they will take notice of what they - and I - say about my boys. Because as sure as anything, my sons won't and will expect me to do it for them. Then Disabled Students' Allowance and Student Finance. We have been through statementing, independent special school, EHCP and back into mainstream and I am so very proud of their achievements so far. What the first post of 2018 will bring (whoever writes it) is anyone's guess. So, I am somewhat older than many of the parents - and professionals - who read this blog looking for advice. Our journey is much further on than many, though of course, we have been where so many of you are now and come out the other side. I hope this gives some encouragement to those of you still in the depths of SEND madness. We, in our family, are lucky that our children have had the support they needed to get this far, because I know many others - including those whose disabilities are far more severe than my boys', who have not, or whose parents have had to spend many thousands getting what should not have cost them a single penny. What strikes me from these few wishes I have plucked out below, is that parents are not wishing for the best of everything for 2017, or even something more than anyone else. They just want the same opportunities for their children that every child without SEND has access to: A suitable education. A school place. To be listened to. Fair play. It's not to much to ask, is it? "Two quality EHCPs for my twin boys... First Tier Tribunals in January"
"A smooth transfer from statement to EHCP and maybe a return to some kind of setting for my currently home-ed daughter." "A school placement ? health, peace and happiness for all. " "Full-time education for my eldest & a good EHCP out of the assessment process currently going on. Also that all mummies fighting their special child's corner are heard and supported." "Wishing that our special children get the education meeting their needs and that the EHCP process gets done as per law." "Accountability and lawfulness in the world of SEND." "Compassion. That all LAs listen to families. That we have understanding and fairness in every educational setting. That good practice is shared. That we have fewer SEND students excluded from the system. That every governing body understands their roles and responsibilities and have policies that are fit for purpose. To have robust systems in place and that every professional working alongside children believes in them ?" "All councils use the money set aside for our special kids actually for our kids and not to fight us with. And all professionals who do not do the job they are paid to do are held accountable." And so, what do you wish for? Leave your hopes and wishes for 2017 in the comments. And a Happy New Year from my family to yours. I hope for all of that too. And another miracle, in the form of someone who will tell me that they would relish the chance to educate my daughter, in a way which suits her and will develop her potential. Happy New Year Tania, 2017’s got to be better hasn’t it?! Well you would hope, but I fear, aside from SEND, the world situation at large can get a lot worse in the next few months. A positive thing though, is you joining us as a columnist and i Look forward to your first post whenever you’re ready! That there is a hint of a direction of what u need to do to ensure I’m not pushed off a cliff of no options with the reason of “as a parent its your responsibility and ergo your fault”. I understand economic turmoil and I understand restrictions but all I want is a clear answer on what I can do and how. Hope first days back at school went well for everyone. Hope you can review some posts here using search and find some help! For my family – I’m hoping my eldest makes his way through GCSEs OK, and gets to do the A-Level & BTEC courses that he wants to do. I’m hoping he’ll be able to do a summer job for the first time – he’s just done work experience, and that went well, so fingers crossed! I’m hoping that the EHCP transitions, PIP application & DLA renewal all go smoothly, but I’m not expecting them to. For the wider world of SEND – I hope that every child who needs it gets the fantastic SEND provision that my two boys have right now. I hope that their parents don’t have to sweat blood and tears to secure it, but I expect that they will have to. I don’t expect strategic change for the better.